In North American birding, east versus west is the most basic geographic division of the continent. It defines and organizes the content of our field guides, and I’m certain that most serious birders here own at least one matching pair of volumes devoted to each side of the Great Divide, no matter their permanent residence. And most – if not all – of us have spent many hours longingly paging through these guides to the opposite side of the continent, pausing to admire the less familiar cross-country counterparts to our everyday backyard birds, wistfully planning birding trips to the other side of the continent, or even studying hopefully in preparation for that lucky day when some hopelessly lost vagrant flies to the wrong coast and lands in our favorite local patch. Of course, reading field guides breeds jealousy. It’s easy for West Coast birders to covet the variety of wood-warblers back east, while eastern birders may lament the dearth of hummingbird species on their side of the continent. The envy goes both ways. “How come they get gulls that aren’t mostly hybrids?” “Why can’t we have magpies too?” “How come their Willet is bigger than ours?” Our only consolation – and perhaps the sole reassurance that we live in an otherwise just universe – is that we all share equally in the curse of confusing Empidonax flycatchers. For birders who also drink beer, there’s only one east-west rivalry in the Americas that really matters these days – West Coast IPA versus New England IPA. But thanks to a transcontinental exchange of brewing ideas, it’s obviously much easier to find a West Coast IPA on the “wrong” side of the country than, say, finding an “Audubon’s” Yellow-rumped Warbler on the Atlantic Coast. It’s still rewarding – just a little less exciting. As hard as it is to believe, the West Coast IPA has lately become the old guard of American craft brewing. Evolving from a long lineage of iconic beers – from early forerunners Anchor Liberty Ale and Sierra Nevada Pale Ale, to the double IPA style pioneered at Russian River, and the hop-obsessed San Diego brewing scene – craft beer from the Left Coast has aggressively pushed the lupulin envelope, redefining and dictating what “hoppy” really means every half-decade or so. Over the years, their secret weapon has been the same: pungent West Coast hops grown in the Pacific Northwest, deployed in ever-increasing quantities to match the appetites of insatiable hopheads. Admittedly, the hoppy “arms race” that ensued may have gotten a bit out of hand, normalizing these pungently bitter, citrusy, pithy, resinous, and piney hop flavors to such an extent that these beers threw all traditional notions of balance out of joint. The West Coast style came to be challenge of sorts, throwing down the gauntlet and daring the drinker to confront hop resins added in such extreme amounts that they threatened – or promised, depending on one’s penchant for masochism – to dissolve dental enamel and obliterate the taste buds with each sip. There was also a certain appeal to bravado in testing one’s mettle by downing the latest “hop bomb”. As the marketing for one iconic Southern California IPA put it “You’re not worthy”– and they probably meant it, too. Hopheads may have been happy, but woe to all others who walked into any self-respecting brewpub expecting to find relief from the hoppy onslaught of IPAs on draft. No quarter shall be given. As implausible as it may have seemed a few years ago, we now find ourselves in the midst of an inevitable reaction against the punchy swagger of all these West Coast IPAs. Not surprisingly, the challenge is coming from the East Coast in the form of the so-called New England IPA, a beer that has taken the craft beer industry by storm in just a few years. Less predictable are the particulars of the style itself, which coalesced at several Vermont breweries around the middle of the current decade. Whether by design or not, the IPA has been recast by New England brewers in perfect contrast to the established West Coast style, trading the brash, piney bitterness of the latter for a light and sunny bouquet of pungent citrus and tropical fruit aromas. courtesy of a new generation of American, Australian, and New Zealand hop cultivars. True, New England IPAs still use their fair share of hops, but they’re now reserved for the end of the boil, where they can unleash their absurdly fruity aromas without extracting too much bitterness. And while brilliant clarity is prized on the West Coast, New England IPAs are pale, hazy, and unfiltered, matching the opacity of the cloudiest wheat beers. Many examples also add starchy wheat and oats to the mash, which contribute to a soft and silky mouthfeel as a gentle retort to the often harsh bitterness of West Coast versions. The result of all these brewing innovations is a beer that very closely brings to mind a fruity, juicy milkshake, or even that soothingly refreshing childhood favorite, the Orange Creamsicle. It’s easy for such a beer to attract derision from beer snobs, and New England IPA has been dismissed as a fad by some, and it remains to be seen where the style goes from here, but there’s no denying that brewers have hit upon something new and exciting in concocting an approachable, easy-drinking IPA that embraces rather than bludgeons the drinker. Luckily, you don’t have to pick sides in this east-west turf war: the style is popping up all over the East Coast, West Coast, Gulf Coast, “Third” Coast, and everywhere in between. In fact, there’s probably a brewery near you making a New England IPA this very moment. But if you’re from the West Coast and want to combine a New England IPA brewery tour with, say, a search for the elusive Bicknell’s Thrush in the Green Mountains, I won’t discourage you. American White Pelicans have been making a bit of a splash in the northeast United States lately, with more and more birds straying into the region over the years. 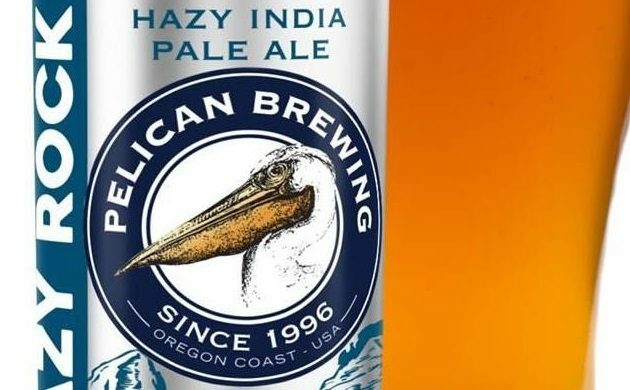 This week’s beer is in the New England IPA style, brought to us by Pelican Brewing Company, a two-decades-old beachside pub and brewery on the Oregon coast in what should be staunchly West Coast IPA turf. 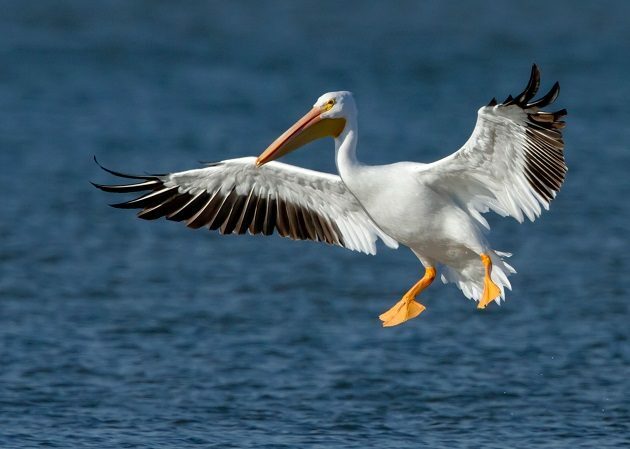 The brewery’s logo is an American White Pelican, a regular in the Beaver State but an incredibly infrequent visitor to Vermont, allaying any concerns about the origins of this East Coast-style beer. 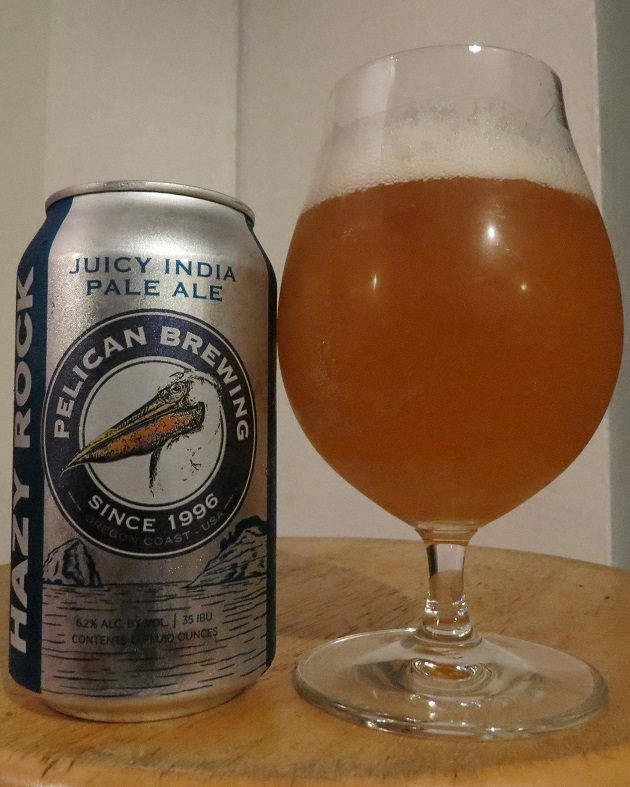 Pelican’s Hazy Rock India Pale Ale is named for Haystack Rock, a well-known intertidal seastack (and seabird nesting site) just a few hundred feet offshore from the Cannon Beach brewery. This hazy pale amber ale is brewed with dried grapefruit and a mix of new American and German hop varieties (Meridian, El Dorado, and Huell Melon), which contribute gentle aromas of peaches in syrup and tangerine, tropical touches of mango and pineapple, and a back note of ripe melon and cucumber. The fruitiness continues on the spritzy palate with cantaloupe and faint strawberry jam flavors backed by a hint of malted oats, and a finish that exhibits a very dry, quinine-like bitterness. Hazy Rock India Pale Ale isn’t as smooth and pungently fruity as the very best New England examples of this emerging style, but it’s a worthy effort from a well-established West Coast brewery open to new ideas. Yet again, I have to thank fellow 10,000 Birds beat writer Jason Crotty for kindly sending me this beer for review, which I would probably never seen in New York otherwise. Cheers again, Jason! Cheers! The Pacific Northwest is a hotbed for bird-named craft beers. Cheers, Jason – and thanks again! Yeah, there’s a whole lot of good beer and wine coming from your side of the country, and I’m glad a quite a few of them are being labeled with birds. I would never have thought that Spike Milligna (the well-known typing error) would be quoted on an American birding site.